It's little wonder there are two books out about the Connacht story this Christmas. The western province continue to enchant. This week, the stars of the tale couldn't have been less likely. 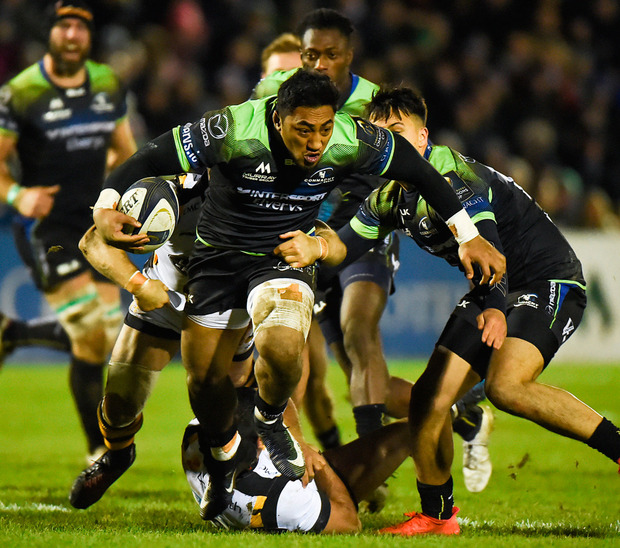 Fijian back-row Naulia Dawai was only registered in their European squad this week and came up with the try that levelled matters in injury time with only his second touch in a Connacht jersey, before Jack Carty delivered the touchline conversion to win it. The Athlone native was mobbed by his colleagues who knew just what the kick meant to him. He had taken a large portion of the blame for last week's defeat to Wasps after failing to nail his kicks, a common theme this season, but here he was delivering when it mattered most. It means a first Champions Cup quarter-final in their history remains in Connacht's grasp. They'll need to win in Toulouse, but they've done that before and would have taken a three-way tie at the top of Pool 2 when things got going in October. Carty had endured a difficult day in Coventry last Sunday and got off on the wrong foot in Galway, missing an early penalty as the home side started strongly. He never looked back, kicking all four of his subsequent efforts and nailing a cross-kick for Danie Poolman's try. He made up for that effort to give his side the lead after eight minutes, but Wasps took over from there and a pair of poor errors as the Guinness Pro12 champions tried to play from deep inside their own half handed the initiative to the visitors. Their big ball-carriers were again causing issues in Pat Lam's defence and after Joe Launchbury made a burst, Thomas Young followed his lead and found Nathan Hughes with an offload. Kieran Marmion managed to haul him down, but quick thinking from Joe Simpson saw the scrum-half pick the ball up and score. Jimmy Gopperth converted and Wasps, confident after their win in Coventry, attempted to go for the jugular by kicking a series of kickable penalties to touch. 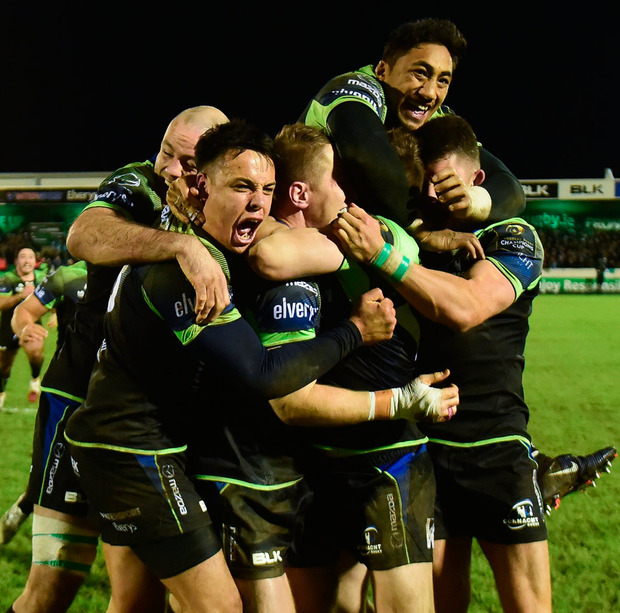 Somehow, Connacht survived a series of onslaughts with Finlay Bealham and Eoin McKeon holding Ashley Young up over the line, before Tiernan O'Halloran saw yellow as the home side got on the wrong side of referee Jerome Garces. As he left the field, his team's prospects looked grim but when he returned they had outscored their visitors 3-0 having held out on their own line before strong defence from Ultan Dillane and a brilliant offload from Matt Healy to Bundee Aki allowed him surge into Wasps territory and an offside allowed Carty narrow the gap. And, having absorbed the pressure, the home side finished the first half on a high as they mauled the English side over the line but couldn't get the ball down, but scored their first try from a subsequent lineout as a smart move allowed Niyi Adeolokun break the gainline before Carty cross-kicked for Danie Poolman to score. The out-half converted and as the teams left the field to a cacophony of noise the complexion of the game had shifted. 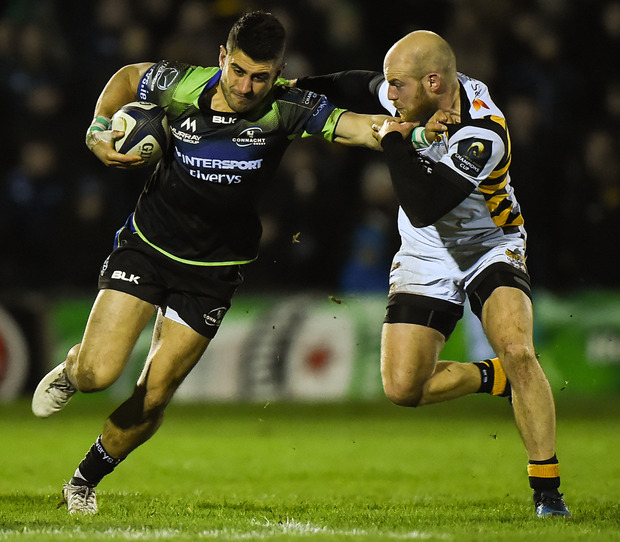 Connacht started the second half with plenty of intent, but their execution again let them down as it had done in Coventry and when Wasps made their first trip into the home side's half they came away with three points through Gopperth after yet more fine work from Young. He missed the chance to draw his side level after a Wasps scrum, now including Marty Moore, forced a penalty. A fine Josh Bassett burst set up an easier kick for the former Leinster outhalf after Conor Carey went off his feet and he levelled it up with 12 minutes remaining. A brilliant Adeolokun tackle prevented Bassett from scoring after a neat Robson chip and good breakdown work from Aki helped alleviate the pressure for a moment, but from a powerful scrum Robson moved it wide to Bassett who made no mistake a second time to score. That looked like being the winning score, but referee Garces was replaced by Mathieu Raynal after incurring an injury and he awarded Connacht a critical penalty and allowed them kick to touch with the clock past 80 minutes. They caught the throw and went to their maul, driving Wasps over and Dawai touched down to send the Sportsground into raptures. The crowd hushed to allow Carty do his stuff. He didn't let them down. Scorers - Connacht: Poolman, Dawai try each; Carty 2 pens, 2 cons. Wasps: Simpson, Bassett try each; Gopperth 2 pens, con. Connacht: T O'Halloran; N Adeolokun, R Parata, B Aki, M Healy (D Poolman 31-40 blood); J Carty, K Marmion (C Blade 74); D Buckley (JP Cooney ), T McCartney (D Heffernan 64), F Bealham (C Carey 62-70); U Dillane, Q Roux (L Stevenson 72); E McKeon (S O'Brien 54), N Fox Matamua (N Dawai 74), J Muldoon (capt). Wasps: R Miller; C Wade, B Macken (A Leiua 66), K Beale (F Halai 78), J Bassett; J Gopperth, J Simpson (D Robson 54); M Mullan (T Bristow ), T Taylor, J Cooper-Woolley (M Moore 59 HIA); J Launchbury (capt), K Myall; A Johnson (A Rieder 72), T Young, N Hughes (G Thompson 65).